This four day self-guided tour will give you a good sense of the incredible variety of landscapes, climates and cultures that are available in the small country of Ecuador. The tour takes you through two distinct regions of Ecuador - the Andes and the Amazon Basin. 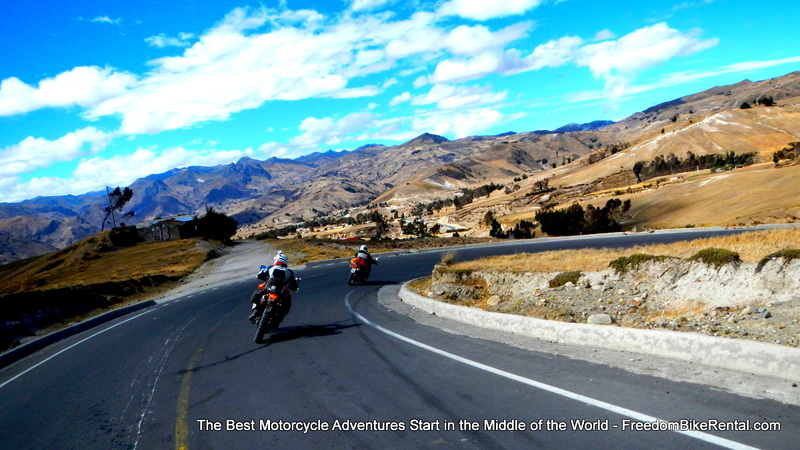 You will ride through the astonishing "Avenue of Volcanoes" taking you past the highest active volcanoes in the world and to the spectacular Quilotoa Crater Lake and its distinct blue-green mineral waters. 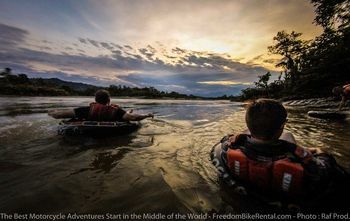 Then, you will experience a ride through the Amazon jungle, packed with lush vegetation and ample opportunities for rafting, kayaking and hiking along the way. You'll enjoy a night in an exclusive Amazon Lodge and take an excursion in a motorized canoe with a local guide to show you the local culture and wildlife in this special region of the planet. The route and accomodations have been carefully selected to provide not only safety, comfort, and great food, but also opportunities to experience other activities such as birdwatching, hiking, horseback riding, swimming, volcanic baths, rappelling, kayaking and cave exploration along the way. Ecuador Freedom provides a pre-programmed GPS navigation unit to accompany a "Road Book" containing thorough, day-to-day information including descriptions of local highlights and "hidden gems" that aren’t common knowledge. You can use this information to tailor your days' rides, including as much or as little as you like. Accommodations: Not included. See "extensions" below for options. We will provide you with a list of recommended hotels in Quito near our shop in the heart of the fashionable La Carolina neighborhood so that you can relax and explore the nearby galleries, museums, and cafés. If you arrive or in Quito a day or two prior to the tour, it would be a good idea to come into the office to complete the paperwork in advance. Please bring your original passport, original drivers' license and a vaild credit card with available credit for the security deposit on the motorcycle. See the motorcycle pages for more information on the required deposit. 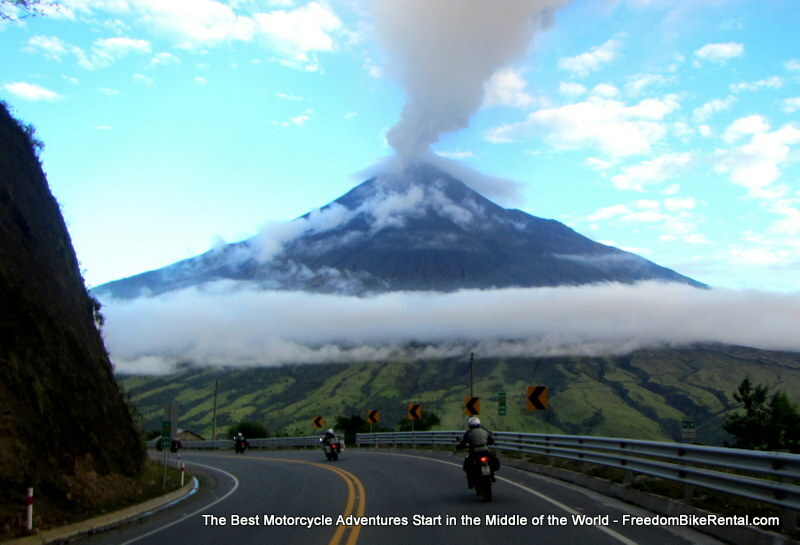 After a briefing and orientation to acquaint you with the customs and rules of the road in Ecuador, you will head out on the motorcycle of your choice that has a GPS navigation system that has been pre-programmed with each day's route. You will be shown how to operate the GPS and given a "Road Book" with daily paper maps listing points of interest, gas stations, lunch suggestions, etc. Your hotel for each night has been reserved and paid for in advance. 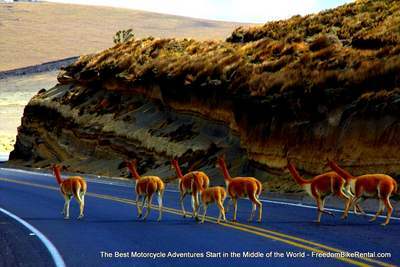 All you need to do now is hop on the bike - and enjoy the ride - safe in the knowledge that you will see some of the best sights and the best roads in Ecuador! You will roll out of Quito on the Panamerican highway, passing incredibly green high-altitude pasturelands and then after a few miles, you will find yourself in a valley surrounded on both sides by two massive mountain ranges. This is the beginning of the famous "Avenue of Volcanoes." You will feel tiny as you roll through this valley with snow-covered volcanoes at either side. On the left you will get an increasingly closer and closer view of the majestic Cotopaxi Volcano, which rises to almost 4 miles in height and is the world's tallest active volcano. The GPS unit will indicate where you will take a right, onto a stretch of road known as the "Quilotoa Loop." This road will take you through many traditional Andean villages with friendly and helpful indigenous people and eventually to the Quilotoa Crater Lake. For now, you will be treated to challenging (but fun) hairpin turns and majestic views. You will pass through the town of Sigchos, a colonial town founded in the 1500's by the Spanish but has a longer history as an trading center for indigenous peoples for centuries. The center of town has a colorful market and there are plenty of restaurants serving up hearty local soups and savory meats. The road weaves along dramatic cliffs with views of the deep canyon below and natural terraces and winds through more Quechua-speaking villages and their centuries-old ways of life. We recommend a stop at the Don Bosco Woodworking shop, where children are taught the art of carpentry. Their work is very impressive. You will pass through the friendly town of Chugchilan and then you'll start climbing to an altitude of over 12,000 feet - arriving at the Quilotoa Crater Lake. This amazing lake is a water-filled caldera and is the western-most volcano in the Ecuadorian Andes. It was created about 800 years ago in a catastrophic eruption that sent pyroclastic flows all the way to the Pacific Ocean. Today it is a calm, peaceful place that will inspire meditation and awe. After gazing in awe at the lake, you will head south through a fertile valley and more picturesque traditional indigenous villages such as Zumbahua, a farming town known for its artisan market of foods, textiles, wool and handmade knives. If it is Saturday it is market day in Zumbahua, and even more worthwhile to stop to see the market. From Zumbahua, you'll climb again in elevation and will give you views of a golden patchwork of Andean countryside. You'll enter the community of Tigua, known for its artists who paint bright paintings of village life and bright colored wooden masks used in traditional celebrations and rituals. The community of Tigua has about 20 different art studios and you can visit the galleries there that display and sell their spectacular work. Tonight's carefully selected accomodations are at the Posada del Tigua - a family-run farmhouse and dairy farm converted into a cozy bed-and-breakfast inn. The farmhouse dates back to the 1890's and has walls that are three feet thick to help you keep warm at night. The family that runs this inn will show you to your private room and then invite you to join them for a healthy, organic meal created from the produce of their farm. This will be one of the best meals you will have in Ecuador. After a great farm breakfast you will re-attach your GPS and start heading towards the east. You will rise in altitude, crossing high altitude grasslands where wild alpaca and llama graze freely. It will be chilly here (40 - 50 degrees fahrenheit) so be sure to bring an extra layer of clothes. The road levels out on the paramo which is dotted with small dwellings made from mud bricks and llama dung with thatched roofs known as "chozas" which are typical simple shelters in this high altitude culture. Then you will descend down twisty switchbacks and into a valley to arrive in the pretty little market town of Pujili. Pujili has a beautiful town square and has market days on Sundays and Wednesdays. 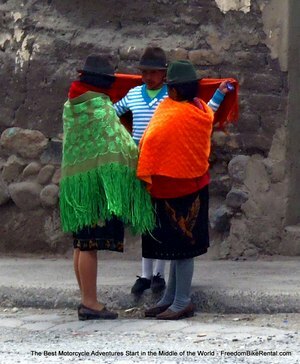 From Pujili, you will take an ancient cobblestone backroad into the town of Latacunga. 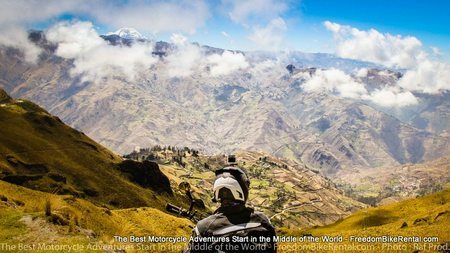 With fantastic scenery at all times, rejoin the Panamericana Highway and ride along the palm-lined boulevards of the city of Ambato. Ambato has wonderful restaurants and an upbeat, positive energy. 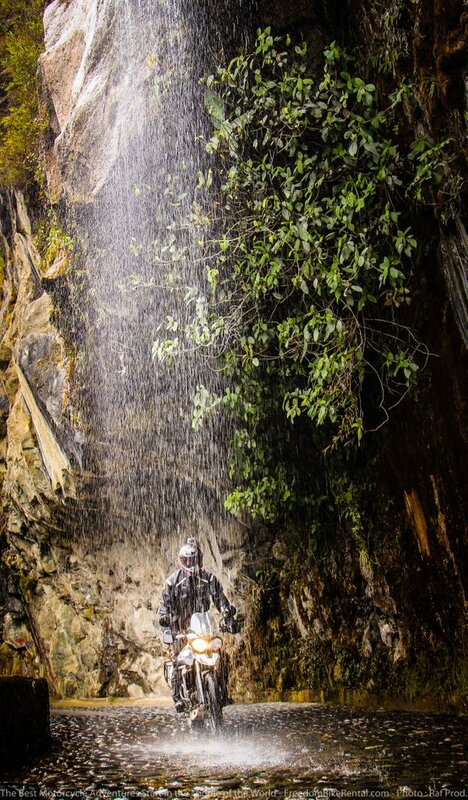 You'll leave the city on the Ecoruta - a small, lesser-known back road that will take you along the roaring whitewater Rio Ambato. You'll climb along this canyon road and watch as the river becomes narrower and narrower as you increase in altitude. You'll carve through tight corridors of rock and cross several one-way bridges. The air is chilly again as you reach the paramo at over 14,000 feet. You can stop at the Kunuyacu Hot Springs for a soak. It is a special, local place where the local gauchos relax in the volcanic waters while restoring their energies with fresh roasted river trout. 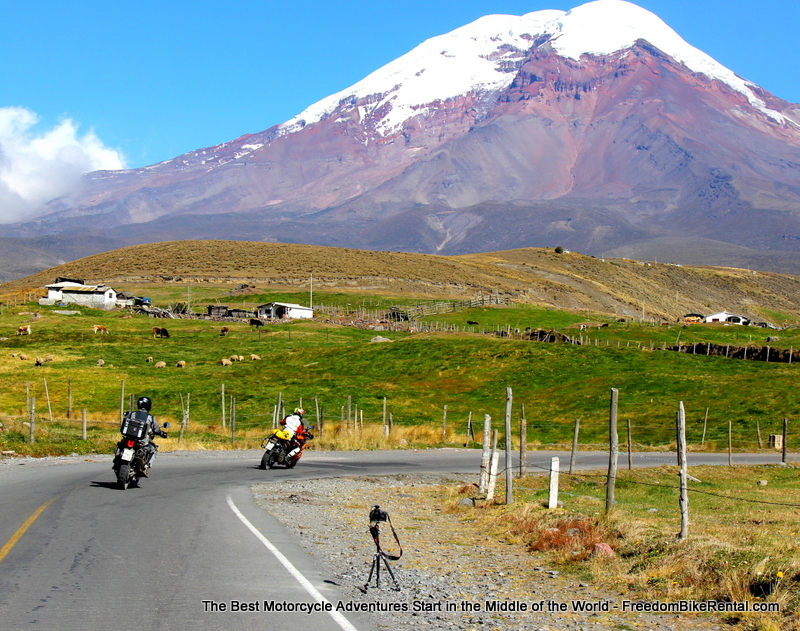 You will curve around the base of the Chimborazo Volcano, which soars above at a height of 6,310 meters (20,702 feet). This is the highest mountain in the Americas and is the highest land mass on earth when you take into account its proximity to the equator. In other words, this is the place on Earth that is closest to Heaven. The Chimborazo National Wildlife Refuge is home to one of the most well-protected populations of vicuña in the world. Vicuña are in the same animal family as the llama, alpaca and camel and are especially well-adapted to very high altitude environments. You should able to get a few good photos of these majestic animals. Coming down again in elevation, you will cross through the colonial city of Riobamba and continue eastward, following the Chambo River and scenic valleys. You will see the active Tungarahua Volcano take up more and more of the horizon as you approach it. It is a very active volcano and erupts several times a year. The sounds of the pyroclastic flows are very impressive. You will then arrive in the town of Baños at the base of the Tungarahua volcano - one of the best adventure-sports centers of the world. Be sure to soak away the day's ride in the volcanic baths that are kept at varying temperatures and then grab a meal at one of the town's fantastic restaurants. You will be staying in the carefully selected Posada del Arte which has excellent service and access to all of the things that Baños has to offer such as rafting, hiking, canyoning, rappelling, kayaking, and puenting. After a refreshing night in Baños you will begin a long, curvy descent into the Amazon basin passing by several stupendous waterfalls and through a few narrow tunnels. On the bridges outside of Baños you will have a chance to do a bridge jump (called "puenting"). Bridge jumps are not "bungee jumps" - you actually jump off the bridge with a non-elastic rope. You will swing out and under the bridge. Its a rush that we recommend you experience! Also along this route are other opportunities to do a zip line headfirst into a waterfall across a 300 foot canyon and many other fantastic adventure sports activities. 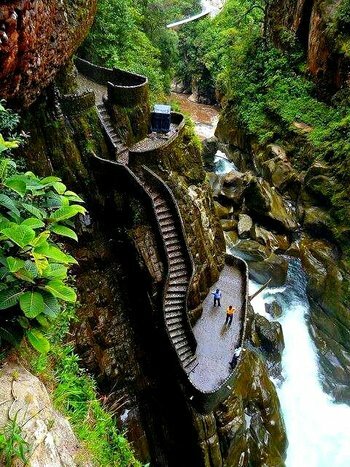 You can park the bike in a secure parking lot and take a 20 minute hike down to the Pailon del Diablo (Devil's Cauldron) waterfall. You will be amazed at the power of this falls which crashes down about 200 feet into a hole that cuases the water to push up gusts of air and mist. The stone steps down to the falls and viewing platforms are well maintained and worth the hike. Back on the bike, you will continue downhill and the temperature and humidity in the air increases. Different tropical plants will give you aromas you haven't sensed before on this trip. You will have arrived in the Amazon region, and the small city of Puyo, the capital of the Pastaza province where you will notice a distinctly different culture and climate than of the Sierra. The Amazon Basin is home to seven indigenous nationalities along with the mestizo population. Their forms of living, food, music, and religion, as well as their languages are quite different from their highland counterparts. At the lodge you can have a swim in the sandy banks of the Napo or hop in your own private dunk pool in your private riverside cabin. You'll enjoy a gourmet dinner at their restaurant - known as one of the very best in the country. You'll enjoy a night of the pure cacaphony of sounds in the Amazon jungle. In the morning you will be treated to a full breakfast at the lodge with fresh fruits, juice and eggs and then taken to the boat house where you will be fitted with a life vest and rubber boots. You'll board a long, motorized canoe that will take you up the Napo River. You will go for a short hike through secondary forest with a native guide who will point out several plant, animal and insect species that are in this Amazon jungle rainforest. He will explain their traditional uses and herbal remedies. 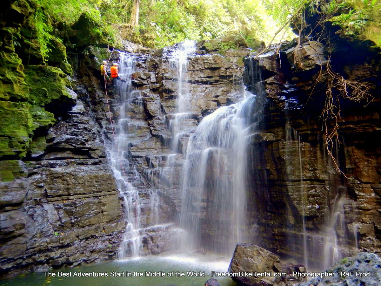 Then you will go for a swim in the beautiful Cascada de las Latas. This amazing waterfall has a natural rock waterslide and a water pit for bathing. There are a couple of other waterfalls that can be visited during your stay depending on time. There are other activities available such as a visit to a local Kichwa community where you will learn to hunt with a blowgun, pan for gold, make chicha (a local alcholic beverage made from root vegetable) and make pottery. To get back to the Lodge, you will float down the Napo River on inner tubes and enjoy the serenity of the jungle. Please note that the excursions provided by the lodge are subject to change due to weather conditions or other factors that we cannot control and other activities may be available on request. Back on the bike, you cross a one lane metal bridge into the town of Puerto Misahualli. This is the western-most navigable port of the Amazon river basin. From here, you could take a boat all the way to the Atlantic ocean via the Amazon river. Puerto Misahualli has a mischievous monkey population that loves to play with the local dogs and tourists. Be sure to bring your camera! You will pass through the rainforest town of Baeza and start the climb back into the Sierra. Then you can have another stop and opportunity for bathing and swimming in the thermal springs of Papallacta before heading over a high (and chilly) mountain pass at 4,200 meters (about 13,400 feet) and an easy ride back into the magnificent capital city of Quito via the funky bohemian neighborhood of Guapulo. 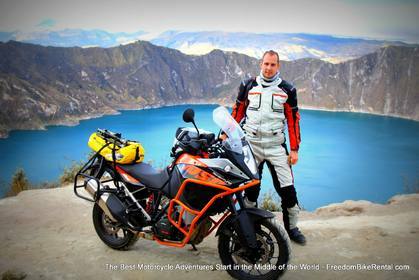 On the morning of your departure, you will be provided the adventure motorcycle (or 4x4) of your choice which is fitted with waterproof luggage system, a first aid kit, a tankbag if you want one, spare innertubes (or tire repair kit) and a set of tools. In addition you will have a prepaid cell phone to call us for support at anytime during your trip. We will carefully review the bike using our mult-point checklist to be sure that everything is in perfect working order before your departure and that you know what to do in case of an emergency or breakdown. The route you will follow over the next four days is based on several years' of experience and riding these routes many times on our guided version of the tour. The route consists of paved backroads that avoid traffic as much as possiblel. There are several stops available which are marked on the GPS unit and the daily route sheets. Upon request, Ecuador Freedom can provide you with route options containing some off-the-beaten track unpaved, natural dirt roads. Weather and temperature ranges in Ecuador are generally the same year round. In the highlands, you can expect the chance of passing showers but rarely a full day of rain. Chances for a full day of rain are more likely on the western slopes of the Andes in March, April and early May. This ride will be in elevations between 1200 feet in the Amazon basin (where temperatures can be around 80 degrees fahrenheit) to 14,500 feet (where temperatures can be in the 30's fahrenheit). Dressing in layers is recommended. Plesse see this article for more nformation about the weather in Ecuador. Throughout the tour, you will stay in carefully selected, ideally-located, non-touristy, comfortable accommodations. See this page for details, photos and links to the accommodations provided. Ecuador Freedom has the right to substitute accommodations of equal quality due to availability and will notify you of these changes. A family home on a working organic farm. The Posada del Arte is a cozy bed & breakfast / art gallery in the best part of Banos. The El Jardin Misahualli Lodge offers great food and beautiful riverside cabins.